The term eczema can be used interchangeably with the term dermatitis. However both terms just describe a pattern of inflammation in the skin rather than a definitive diagnosis. If possible the cause needs to be identified. Atopic eczema is the most commonly seen subtype and is predominantly caused by genetic factors. However, even though there is a genetic basis, the importance of environmental factors which can influence its course cannot be over emphasised. These include environmental temperature and humidity, stress and upset, skin infection, irritants and allergens and occasionally diet. These factors must also be addressed in treating eczema. 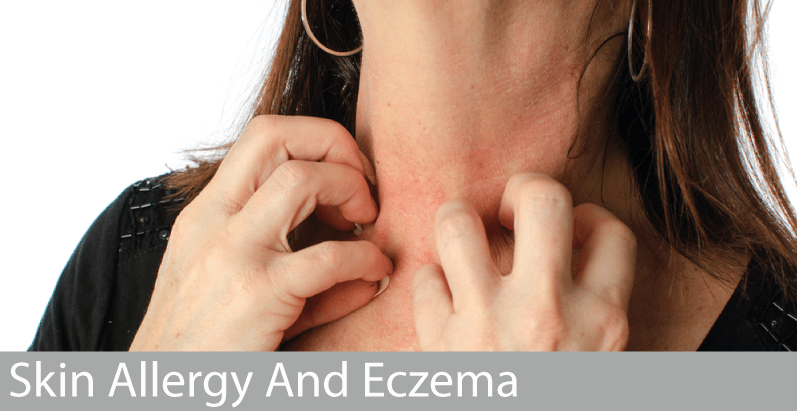 Allergic contact dermatitis can also complicate atopic eczema and other forms of eczema eg by becoming allergic to a topical steroid, a topical antibiotic or a chemical in a moisturiser prescribed to treat the eczema. This may be suspected if the eczema does not respond to treatment as expected. Patch tests can be used to identify if contact allergy is the “cause of” or “contributing to” eczema. However, Allergic Contact Dermatitis can be the cause of eczema (dermatitis) in its own right, eg developing an allergy to a hair dye chemical, a fragrance chemical or a preservative in a cosmetic product. In new onset eczema and particularly if it involves certain sites or patterns eg face including eyelids, hands, ears, anogenital region, feet, exposed sites, – it is considered good practice to exclude contact allergy as the cause or contributing to the eczema. This is done by performing patch tests.